If you want the best training around, look no further. Marc and his team are fundamentally the best all around trainers and nicest individuals you will ever meet. Give them a call today, don't wait!! I promise it will be one of the best decisions of your, your kids and your horses life! Marc is a very talented individual. With the sweetest family!!! Unlike some trainers, my training is based on philosophy rather than a rigid approach. I firmly believe the key to successful horse and mule training is balance. There are always going to be exceptions to any rules. This is certainly true in horse training. No two horses will react to a stimulus the same way. As a result, if you try to be rigid or “by the book”, you will almost certainly run into some serious road blocks in your training and could quite possibly be leading your horse into more problems down the road. I have specific “stages” I will take every horse through. These stages may or may not be in a certain order depending on the horse. The “Balance” that I refer to allows me the flexibility to train the horse using a different approach for each horse but the end result is always to ensure that the horse completes each stage before moving onto to the next. Whether you bring me an untouched colt or a seasoned trail horse, I will always begin the training assuming that the horse has never been handled. This allows me to create a firm foundation to build from. Each stage I take your horse to will only be as successful as the previous stage. For example, if I don’t ensure that your horse can disengage his hind quarters from the ground, there is no way that I can expect him to disengage his hind quarters using a one rein stop. Being that a one rein stop is an emergency maneuver, I would much rather ensure early on in the training that this step has been addressed. Depending on my workload and schedule, primary training will be provided by either myself or by one of my trainers personally selected for you your horse by me. These trainers have been on my staff quite often for many years and have successfully completed my rigorous apprenticeship program and have served as intern trainers under my direct guidance. 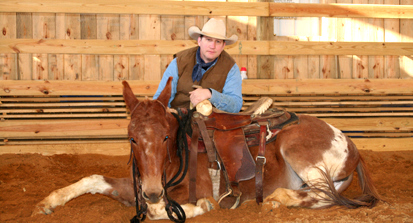 No matter who the primary trainer is, I guarantee your horse or mule will receive the high standards of professionalism and balanced horsemanship that Dixon Stables has become known for. Each horse owner will have specific goals in mind for his or her horse. Each horse owner will also have different riding styles. Good communication between the horse owner and myself is important. 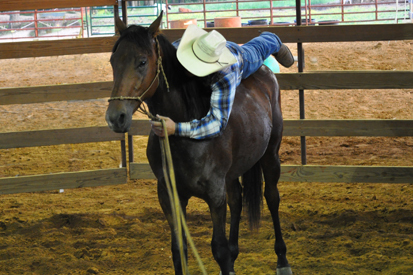 You may ride using direct reining while someone else will neck rein. You may choose to use leg queues. You may be preparing your horse for barrel racing or reining events. Or, you may simply want a well mannered trail horse. In any instance, please communicate this information to me prior to training. I have always had an open door policy when it comes to my training. Owners are always welcome and in fact encouraged to attend their horses training sessions. Your participation is KEY to the successful training of your horse. While your participation is not required, it is strongly encouraged. I highly recommend owner attendance at least one day a week during training. WHY should you attend? Simple! When you are here, it is much easier to discuss the progress of your horse as well as to educate you as to any potential “issues” your horse may be having and how to successfully work through those issues should you encounter them when you get home. Horses thrive on consistency and repetition. If you are able to watch, ask questions and be able to see how I handle your horse and then take those techniques home with you, you will be much more successful and have a much happier relationship with your horse moving forward. Marc Dixon is well respected among his peers for his quality horse training as well as the training clinics he gives both local and abroad. Contact Marc today at mdixon@dixonstables.com. Learn about our training family and find out what it takes to become one of our hand picked, staff trainers.